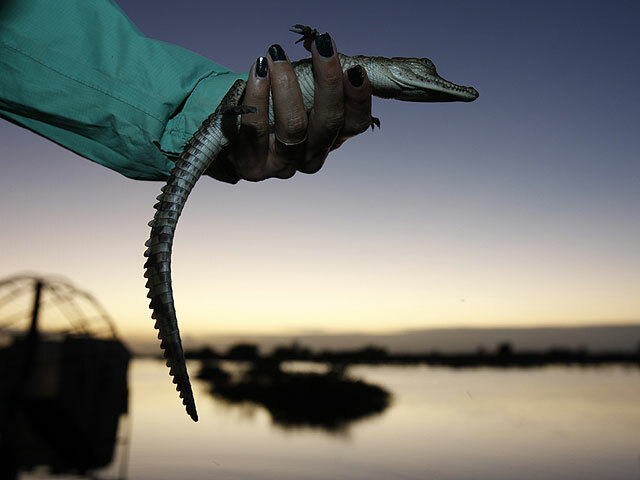 HOMESTEAD, Fla. - An unexpected but fruitful relationship has blossomed between two potent forces in the swamps of South Florida: the American crocodile, and a nuclear power plant. The reptile has made it off the endangered species list thanks in part to 168 miles of manmade cooling canals surrounding Turkey Point Nuclear Power Plant in the southeastern corner of the Florida peninsula. It turns out that Florida Power and Light was building prime croc habitat just as virtually every other developer was paving it over. Federal wildlife officials give the state's largest public utility part of the credit for a five-fold increase in the species' population in Florida. There are only two other sanctuaries for the crocodiles, which are still considered threatened. "The way the cooling canal system was designed actually turned out to be pretty good for crocodile nesting," said John Wrublik, a biologist with the U.S. Fish and Wildlife Service. "It wasn't designed for crocodiles, but they've done a very good job of maintaining that area." Hundreds of crocodiles, as long as 15 feet and as heavy as one ton, roam the swampland surrounding the power plant. They're monitored by wildlife biologists hired by the utility, who sometimes need quick reflexes to keep all their fingers. On one recent nighttime survey, Mario Aldecoa jumped from an airboat in total darkness and darted into the bushes to grab a 13-pound crocodile to mark it for identification. "It's usually just adrenaline and instinct," he said. The American crocodile is often confused with its plentiful cousin, the alligator. Alligators are black, have broad, rounded snouts and are found throughout the deep South. Crocodiles are grayish, have narrow tapered snouts and are so sensitive to cold that their only U.S. habitat is in South Florida. South Florida's rampant development eroded the crocodile's habitat over decades of booming growth. By the 1970s, there were less than 300 in the state. The federal government had classified the species as endangered, meaning it was in danger of becoming extinct. In 1977, Florida Power employees stumbled upon a crocodile nest in the plant's cooling canal system. A monitoring program set up a year later was originally intended to ensure the plant did no harm to the species, but ended up recording the facility's role in the crocodile's rebound. Dozens of other protected species, including the manatee and loggerhead turtle, also are found on the utility's properties across the state. There are more than 1,500 American crocodiles in South Florida today. An opinion issued by the U.S. Fish and Wildlife Service in May 2006 noted that the increase in has been attributed to Florida Power's management activities in its cooling canals. Canals and berms such as those found at the power plant site provide nesting habitat that has "to some extent compensated for the loss of habitat elsewhere," explained Frank Mazzotti, a professor of wildlife ecology and conservation at the University of Florida. The recirculating water system at Turkey Point works somewhat like the closed cooling system in a car. Eight large, powerful circulating water pumps take cooling water from canals at Turkey Point and circulate it through a condenser. The water then flows back to the closed-loop canal network, which essentially serves as a giant radiator. Aided by such habitat, the crocodile has since gone from "endangered" to "threatened"  a small step toward their survival. Government and utility biologists have detected no sign of radiation in the animals. Florida Power biologists monitor the reptile's population growth and survival rates at the plant under guidelines set by state and federal regulators who oversee the program. The animals are quickly weighed, tagged with microchips if this is the first time being captured, marked with white (to keep them from being captured twice on the same night) and slipped back into the water. Microchips are used as a reference ID  much like a thumb print  to scan the captured animal, as well as to track any animal that falls prey to others as a result of cannibalism. Biologists said one crocodile was found with eight chips from other crocodiles inside its belly. The bony plates or scales on crocodiles, called scutes, are clipped during first captures. The markings are permanent and represent the animal's number and location of capture, which could be one of three sanctuaries including Turkey Point. On average, crocodile experts such as Aldecoa capture 350 baby crocodiles each year out of approximately 22 nests during the summer. About 400 adult and adolescent crocodiles can be found in the plant's canal system at any given time, according to state data. The plant is remote, making it difficult for humans to disturb the animals or their habitat. That isolation, wildlife officials noted, also has contributed to the species' population spike. "We wouldn't advise people to normally make those types of impacts," Wrublik said of removing wetlands to make way for a nuclear power plant. "But this just so happens to have benefited the crocodile population." Aldecoa said crocs are not nearly as aggressive as many people imagine. "They're shy and sensitive to sound and to movement," Aldecoa said. So much so, he said, that biologists often have just one chance to get a snare around a crocodile's neck before it scurries away. "They are very misunderstood. All reptiles are," Aldecoa said. "They are a lot smarter than people think. And they just look like dinosaurs, and that's pretty neat."